Michael Jackson inspired artists in various genres. Many modern musicians and dancers chose their professions because of the effect of Michael’s music upon their lives. But there are some who were inspired not just by his music, but by his personality and the persona he created of himself. Alena Galayko, 30, is an artist from Moscow, Russia, and a big fan of Michael Jackson. I’ve known Alena for 8 years, but I only got to really know her after having seen her wonderful paintings. When you look at her works dedicated to Michael, you are amazed by how alive and real they are. 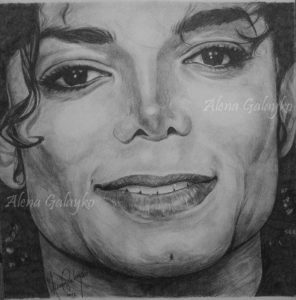 Alena is a rare artist who is able to not only depict Michael’s face on her canvas, but show his soul. Alena says that she’s not used to being open about her affection for Michael, but she’s agreed to talk to us. MJ.ru: I have to say I was amazed when I saw your works for the first time. When we met years ago, you weren’t doing this much, and I didn’t even know that you could paint. How long have you been doing this? 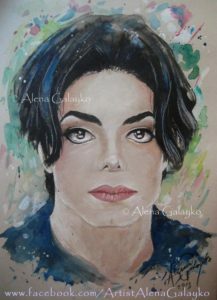 Alena: I started drawing back in my childhood years, but my deep infatuation with art and painting began with falling in love with Michael Jackson. He inspired me to paint his portraits and portraits of other people. Since then, I’ve been developing my skills. MJ.ru: Is it true that, if it wasn’t for Michael, you wouldn’t have become an artist? Alena: It’s probably true. Drawing was just a hobby of mine until I fell in love with Michael. Then I started painting his portraits. His personality and qualities inspired me, and they still do. I tried other occupations, but at some point I realized that painting is something I would like to dedicate my time to, something I want to develop and improve in continuously. MJ.ru: How long have you been interested in Michael, and what attracted you to him? Alena: I first saw Michael on TV when I was just 5 years old. I watched the «Thriller» short film. It scared me to death, it was actually the first horror film I ever saw. It had a great effect on me. Later, I saw many of his other short films, «Jam,» «In The Closet,» «Remember the Time,» as well as his live performances with the famous moonwalk. I thought of him then as primarily a dancer. Later I realized that he was also a gifted singer, performer and, most importantly, an incredibly kind and sensitive person – a philanthropist. I became a fan in 1995, when his History album was released. He had made history on his own, and my personality was only beginning to establish at that time. Michael attracted me with his grace and sensuality in dance, his heartfelt voice and lyrics with deep and resonant meaning. The more I learned about him, what he was like, his worldview and his goals in life, the more he drew me in. I wanted to be closer to him in my actions and thoughts. Michael became like a father figure to me, the father I never had. He was my role model. MJ.ru: What does Michael mean to you? What has he given you besides the inspiration to paint? Alena: I see Michael almost like a family member, as strange as it sounds. We have never met or communicated, but I have felt this special connection to him for years, and I cannot explain it in words. I think that many of his fans will understand me and relate to what I’m saying. He will always be my mentor of life: he taught me how to be a positive person, to never give up and improve, to always achieve my goals and to help those in need. He taught me to believe in good and to never lose faith. Michael made me understand that if you wanted something very much, you had to go for it – and you would make it happen. MJ.ru: How did you feel when you heard of Michael’s passing? What was it like for you? Alena: It’s hard to explain what I felt at that very moment. It was pain of losing someone dear. It was painful and horrible because I felt like the world would be empty without him, and all the good things and hope would disappear. At first I thought that the news was a sick joke, that it was something that could never happen. When I accepted the truth, I felt like half of my soul was gone. The world changed with his passing, it changed forever, and everything is different now. But he’s always in my heart, and I guess I still can’t fully realize that he’s not among us. His music is popular, and as long as we keep him in our memories, he will live forever, he will be with us. 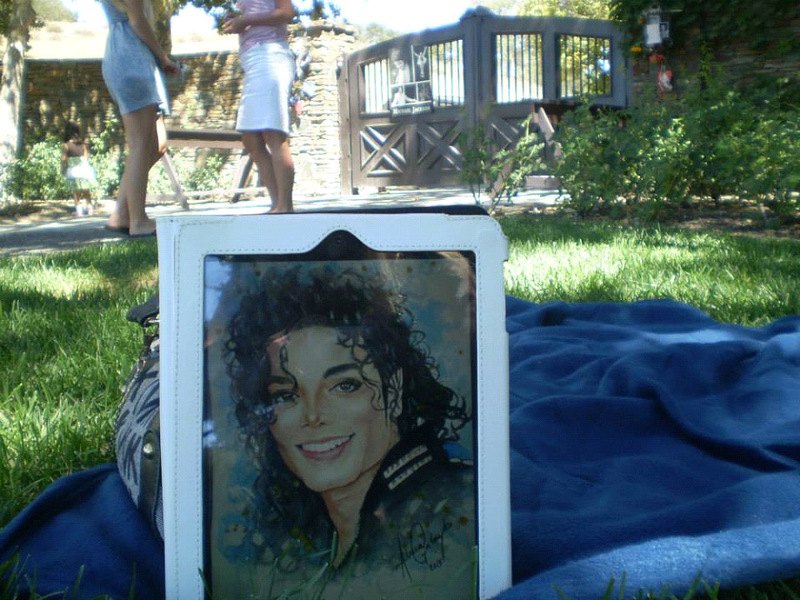 MJ.ru: I have seen many touching photos from all over the world where fans hold your portraits of Michael. Can you tell us about some of them? 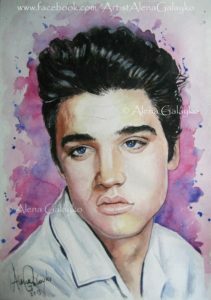 Alena: Yes, I feel very honored that my paintings make fans happy and they take pictures with them to share with others. 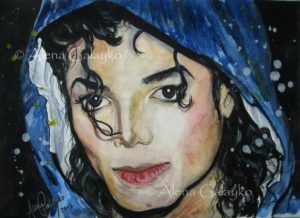 In this way, through my paintings, I can pass my love for Michael to others all around the world. A very touching story happened last August. 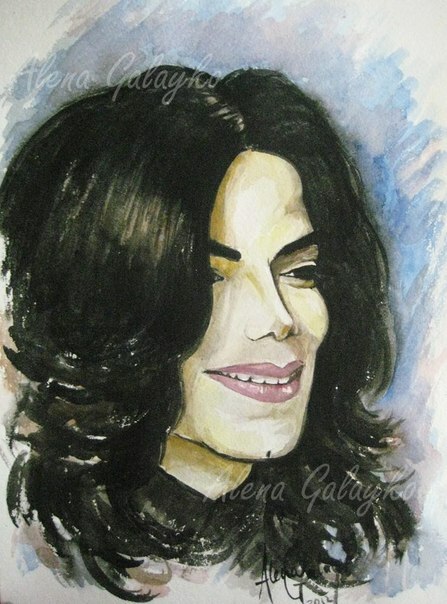 A fan from Canada received my portrait of Michael as a gift. She took it to the Neverland Ranch on Michael’s birthday and sent me the photo with the portrait at the gates of Neverland. It was very nice of her. MJ.ru: You also paint other celebrities. Does this mean that you feel the same closeness to them? 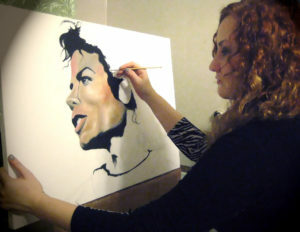 Alena: Yes, I paint other celebrities, but I don’t feel the same kind of affection for them as I have for Michael. Naturally, I like the people I paint. I put my heart and soul into my paintings, and I need to feel positive energy coming from the person. That’s why I paint mostly those people whom I find interesting. MJ.ru: If you had a chance to give a message to those who knew and loved Michael, to his friends and family, what would you say? Alena: I think I would tell them that they were very lucky because they had a chance to talk to and be close to such a unique man. They have to cherish what they had. I hope they keep their memories of him. In that way, he will always be here. You can visit Alena’s page on Facebook. Thanks for the interview, Alena! Alena, you know that I admire you and your work as an artist. I think you speak many of Michael’s fans from the soul. You give us with your pictures so much. In your drawings is so much of Michael, of you and your love. Thank you! Alena, everything you just said was as if your words were coming from MY own thoughts, MY own heart, MY own soul. It is amazing as if we are the same person now. I think about Michael every moment of every day. The pain is still today as the day he left us. Your art is so beautiful and has made me so happy to have it as part of my life! I love you Alena and Michael would have loved you this I know!! He loves you and is inside you with every brush stroke you make when you paint him. He knows you now. Of this I am certain. I am so proud to know you Alena!! I am so proud of you!!! I know that you know how much I love your work Thank you, because when I look at any of you pieces…I feel like Michael is here with me. It is so personal. Alena, as we both know I am an admirer of your Work of (MJ)Art. To have an Alena in my house of your MJSpider is amazing not to say Thrilling! This article I read many weeks ago and just now a comment, I am ashamed but I tekst you already on Facebook many weeks ago. Have a fine weekend gurl.